Taste test: These are very garlicy chips, with quite an impressive amount of flavor. They're also quite good. People around the chip bowl weren't expecting this much garlic, so they were a bit startled when they bit in. 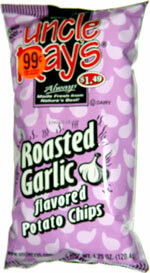 If you don't like garlic, stay away, but if you do, you'll love these. Smell test: Nice, mild garlic smell. 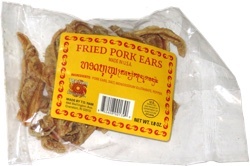 This snack was discovered by Jeremy in Arlington, Massachusetts. Review published .